Make no mistake, Facebook Messenger has revolutionized how marketers can access and grow their audience on Facebook and websites that use many of Facebook’s extensions. Please understand that Facebook is not just one platform, it is actually a set of related properties. It also shares key parts of its functionality with third-party websites. By doing so, Facebook extends its reach throughout the rest of the Internet. In fact, the Facebook ad network is second to Google’s ad network in terms of reach and size. If you want to drive a lot of free traffic to your website, you need to have a coherent Facebook strategy. Now that Facebook has launched Messenger and allowed it to operate with bots, this has presented a tremendous opportunity for online marketers as far as traffic generation and sales recruitment go. 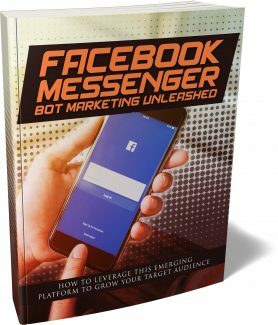 In this book, I am going to teach you how Facebook Messenger works, how you can create bots that would work with Facebook Messenger so you can grow your audience, and most importantly, drive qualified traffic to your website. An FB messenger bot is a piece of software that uses Artificial Intelligence to simulate conversations with potential and existing customers. By 2018, FB had 300,000 active messenger bots, this is several times larger than the previous number and the number of bots is expected to multiply further. What are YOU doing to take advantage of this great opportunity to automate your enagement with your audience. What is Facebook messenger and how can it help your business? A few years back, Facebook announced that it was launching its new Facebook Messenger service. What was really interesting about this reboot of what was its internal messaging device is the scalability of the new messenger. It can be automated, it can use scripts and, most importantly, it lends itself to bot technology. Usually, when people use messenger, they would click on somebody's profile on their messenger application and initiate a text, voice or video chat with them. In this respect, it's not much different from other third party messaging platforms like WhatsApp, Viber, WeChat and others. What really distinguishes Facebook Messenger, let's face it, is the fact that it is attached to Facebook. Facebook has billions of active users. It is a gateway to tremendous online visibility. If you want your business to thrive, you only need to look no further than Facebook. Whatever interests your business caters to no matter how arcane, obscure or little known, there are sure to be people on Facebook who are interested in whatever it is you are promoting. This is why Facebook is non-negotiable when it comes to online marketing. Whether you're trying to generate traffic to the website of your local dental practice, or you provide a national service to people located all over the United States, Facebook can help you market your business. Facebook Messenger is an important part of this marketing mix because it enables you to automate your engagements with people trying to get more information about your business. When people find your business' Facebook page, they can get basic information like your hours, whether you're currently open or closed, maps and directions, as well as an overview of what you offer to the general public. But you know and I know that for your business to close the deal, there has to be some sort of personal touch. The person seeking your business' services and/or merchandise would want to reach out. They may want to get more information or they may have certain questions that you page simply can not anticipate. Whatever FAQ you may have up may come a bit short as far as the wide range of questions, queries and concerns people may have. This is where Facebook Messenger comes in. Facebook Messenger gives you “stop gap” and “catch all” communications option Unless you have doe extensive consumer intelligence, there's really no way you can anticipate all the needs and concerns of your customer base. That's just not going to happen. You need a tremendous amount of resources, time and energy to be able to pull that off. The good news is you don't have to. Thanks to Facebook Messenger, you can be accessible to people with a wide range of questions and then message them back. Once you detect a certain pattern in the most common questions people ask, you can automate Facebook Messenger so it can answer questions based on a decision tree. In this respect, it's not much different from your potential customers calling a call center. Now, if you own a small business in middle America, you know that hiring a call center is not exactly within your budget. But the good news is with Facebook, you don't have to. If you set up your Facebook Messenger bot correctly, it can anticipate or it can filter inquiries people have and break it down into finer points so your prospective customers can get the information they desire. If anything, they can get enough information to satisfy them until you follow up and give more detailed and specific information. By using Facebook Messenger and automating it through Facebook Messenger bots, you enable your brand to distinguish itself from the competition. Let's be honest here. More and more American businesses are moving online. Having a website and having a robust presence on social media platforms like Facebook are no longer optional. They are absolutely necessary. In fact, they can make or break your business. This should not come as a surprise because most Americans already have mobile phones. When people have mobile devices like tablets and phones, the moment they think about buying something, they quickly check online resources. The same goes with finding a local source of the merchandise or service that they are interested in. if your business is not part of that mix and is not visible enough online, you're going to lose customers. Now, with this as a background, when you set up Facebook Messenger to engage with your prospects, your brand stands head and shoulders from your competitors. Your competitors might just be unavailable or people who would otherwise be interested in what your competitors would have to offer would not do business with them because they can't get the information they need at precisely the time they needed it. With Facebook Messenger automation, you can get this information to people interested in your business. If anything, you can hold them with enough basic info until you can follow up with more specific information.